Baseball season is coming up. I am so ready to go watch the Cardinals play this year. Last year was not good. Three new players this year might us back on track. I made coasters for this season and play to give them to one of our kids who is also very much a Cardinal fan. This is my own creation. What's your opinion? While I'm not a Cardinals fan, I too am dying for baseball season! LOL (I'm a Dodger fan) It just can't get here soon enough! I may not be a Cardinal fan any longer if they play like they did last season. Was a nightmare! Thanks for responding and good luck to the Dodgers this year. LOL, I totally hear you, I have had those feelings about the Dodgers some years! I'm so excited to see what Joe Torre does with the team! Good luck to your Cardinals, may they have a better season this year! I, like you, am very excited about the upcoming season. I root for two teams, the Royals and the Mariners. I think Seattle will do better than KC. I try to get my kids 6 and 7 interested in baseball but haven't figured out quite how yet. My wife is well.... less enthused about the upcoming season. Love the coaster by the way. Two thumbs up. Thanks, I do enjoy making the coasters but they take forever to finish a set of 4. The Cards are about due for a decent season. Edmonds is gone and that hurts. Thanks for responding. Wow! Carol those are gorgeous! 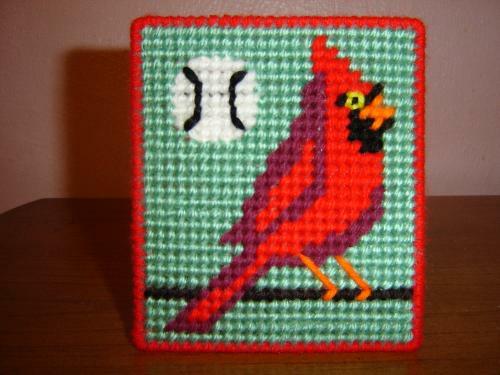 the cardinal is my favorite bird too - that design would be great on a sweater or sweatshirt. I wonder if you could not get a consignment contract with the souvenir shop at the stadium making your coasters for fans to purchase! I have not been to a St Louis Cardinals game though my father always spoke of the times he used to. We have, however, been to a few of the Springfield Cardinals games and had a great time... exciting indeed! I briefly talked to my husband about this and he said it wasn't a good idea. First of all there is a copyright on any Cardinal items sold at the stadium. This is my design but there really is no way I can prove it. Obviously by the shape of the baseball, it's my design. On the other hand, I didn't take this from the Cardinal site or steal their idea. The person I would have needed to get in contact with at the stadium, if this was a doable thing, recently passed away. Also, I am the only person who makes these coasters and I'd be close to 90 before I could finish 50 or 100 of them. Very time consuming although I enjoy it. Thanks for the compliment and the good idea. I appreciate your advice. Love the coaster, really good job carolbee. I am not a fan of baseball myself not sure why I never got into watching that sport. I did of course go and watch when my son played and when my grandson played tee ball, does that count? haha Enjoy the baseball season. Sure, watching our kids and grandkids play ball counts. That makes you an official fan. Thanks for responding. I'm not a baseball fan but what a great photo - I love birds, all kinds. I would love to know how you made this and if you do other birds also. Do you have a pattern? Can only make a Cardinal. The bird pattern I found online but sure can't remember which site. Might have been MountainHarmony.com. Sometimes I buy patterns from AnniesAttic or one of those places who sells various patterns. I used 7 mesh plastic canvas which I generally buy at Walmart. It's dirt cheap. The baseball I tried and tried until I got it right..lol Thanks for responding. your relatives are going to go absolutely BATty over these coasters... your perseverance has paid off, they are very good!